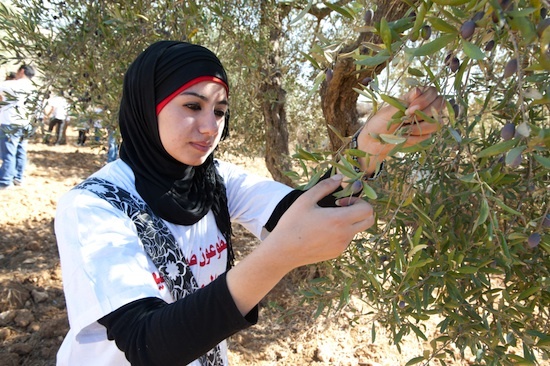 From November 1-8, 2015, join CODEPINK for an exciting week in the West Bank to learn firsthand about the impact of the Israeli occupation on daily life and explore agriculturally sustainable practices in Palestine. The trip will enrich delegates’ understanding of cultural heritage, geography, and the hospitality that is part of Palestinian families and their ongoing nonviolent resistance to Israeli occupation. Submit your delegate application now! The extensive and exciting itinerary includes visiting Ramallah with the organization Stop the Wall, where the day will be spent learning more about the current situation in Palestine and how it is affecting neighborhoods and villages, with visits to Anza, Jenin, Nablus, Sebastiya, Nus Jbeil, and Burqin. The activities throughout the week range from sight-seeing around cities to explore ancient landmarks and Palestinian history, to visiting PFTA (Palestine Fair Trade Association) and learning more about organic programs and the organization. We will also spend a day with Palestinian families and hike mountain Jabal Al Aqra’. The highlight of the trip will be the Annual Olive Harvest Festival, in which we will participate in olive picking, folk dancing, singing, and celebrating with our new Palestinian friends. Another component of the trip will be learning about the deep ties Palestinians have to their land. The focus on agriculture will allow the delegation to experience meals cooked with ingredients from sustainable sources and local farms. Revel in a couscous dinner that you can help prepare with Palestinian women or a harvest meal served in the olive orchards. And through the Fair Trade Association, you’ll learn how you can continue to support the Palestinians when you return home. The delegation leaders will be Alli McCracken, the National Coordinator of CODEPINK who has been on several trips to the West Bank and lived in Beit Sahour for several months in 2010. Also helping to lead our delegation will be Adam Eidinger of Mintwood Strategies, who has worked to develop fair trade initiatives with the West Bank, including the sales of certified organic and fair trade olive oil from Palestinian farmers we will meet. Adam will bring a unique perspective to the delegation shaped by frequent visits to the West Bank and Israel since the 1990s which have centered on the concept of building a peaceful future through economic and social cooperation. The cost for the trip is $1,400, including accommodation, local transportation, guides, meals, and trips to and from the airport. Airfare not included. Space is limited, so please fill out this delegate application and make a non-refundable* deposit by October 1 (full amount due October 10th). We cannot hold a place for you without a deposit. *Please note that if spots fill up or if your application is denied, your deposit will be refunded. Send a check (made out to CODEPINK) to CODEPINK, 1241 Evarts St. NE Washington, DC 20018, (and then inform mike@codepink.org so we can mark you as paid), or pay online HERE. **Important** if you pay online, you must pay $520 (an extra $20) because of a 4% online bank fee. Trip FAQs can be found here! Scholarships are available (especially for young and low income folks). Please send Alli@codepink.org a note explaining how much money you are asking for, why, and what you are doing to also raise money. Join us in this incredible and unique trip to the West Bank! It’s wonderful— as are all your projects! Just concerned: you will not be competing with Global Exchange, will you? what airports are being used and are we flying together or do people make completely separate accommodations ?